If you didn’t sow Larkspur seed in October for flowering in late spring, no worries. You’ve missed the distinctive, feathery seedlings that appear by late winter, but you can order the plants online or at your local gardening center. Larkspur (Delphinium consolida,) which symbolizes an open heart, tends to be temperamental, and I’ve not had much luck in the DC-area. 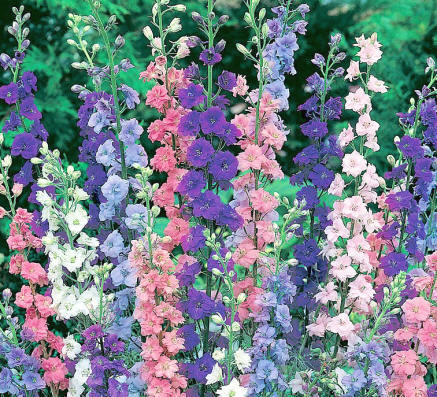 But if you have success, Larkspur is a beautiful addition to any garden. And for those born in July, this is your birth flower. Each color has a different meaning: the color white symbolizes joy; the purple symbolizes sweetness: and the pink flowers = fickleness. There is no better personal touch to your garden space than Larkspur if you’re a July baby. It’s important that remember that all parts of Larkspur are poisonous. Please be careful when including Larkspur in your landscape.